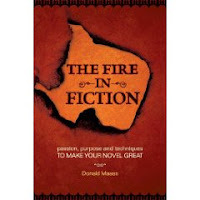 I've been looking through The Fire In Fiction by Donald Maass. I'm a fast reader and sometimes miss important facts, so I often have to re-read books to really soak up information. Maass's chapter on secondary characters really pounded in the fact that I really ignore mine! I tend to focus on the hero and heroine and stick my secondaries into the background, safe and sound. Poor things, they need more of a life so they can support the main characters like they should. 1. Special Characters: Who are the people that make an impact on your character's life? How have they made a difference in your protaganist's life? What makes these characters special is how they have changed your hero/heroine. What details show this to be true? 2. Ordinary Characters: These are the people in your protaganist's life that are taken for granted. One way to spice them up is to make them eccentric, make them quirky. While making them unique, you need to make them human too, so give them a conflict they must overcome. 3. Antagonists: Too often these can become "cardboard" characters who are entirely evil, which makes them entirely boring. These bad guys need some redeeming qualities. We need to somehow relate to them and even root for them at times. They need be in the forefront and in the hero's face, not relegated to the background. According to Maass, secondary characters are just as important to the story as the protagonist. We need to make sure our supporting characters are real, are human, are memorable. How about you? Do you enjoy writing quirky secondary characters? How much thought do you put into these? What is your favorite type of secondary character to write? I LOVE secondary characters. They always turn into a main character in the next book!!! And I LOVE diving into the minds of my antagonists to find out why they're so bad. There's always a reason, and once I figure out the reason, it makes him/her more 3 dimensional. Great post! You've definitely given me lots to think about - especially with one of my secondary characters in particular. May have to make him not quite so "icky." My first take on my secondary characters (whoa! That phrase made me stop and think for a minute.) was kinda boring. Then I went back and spiced them up a bit. So the first round of writing was all about getting them into the story. The second round of rewrites was giving them a reason to stay in the story. Jeanne, glad you enjoyed it. I'm not that great at quirky, but I have tried to give my antagonist a teeny bit of a redeeming quality. Just a bit! And you are good at writing it. I love delving into the mind of the bad guy. There is always some backstory into why they think like they do. It's fun to dig and figure it out. Joanne, have fun finding something good in your character! I'm sure you will do a great job! Oh Sarah, I'd love to hear about some of the quirks of your secondaries! I bet you could think of some good stuff. I like annoying secondary characters that help to push tension in stories. In my earlier writing, I was really bad about giving the secondary characters all the off stage drama and letting the protagonist feel the impact from it...instead of giving the drama to the protagonist! I love good secondary characters who thicken the plot with their shinanigans (sp?)! Occasionally they feel flat, but a lot of the time they kind of grow themselves... It's my MCs that don't trust me enough to open up until like a year later, during revision. Peaches, with a name like yours, I find it hard to believe you like anything but happy things! But yes, I think of Nellie Olson on Little House on the prairie and she was the MOST annoying character ever! (besides her mother!) Annoying is a good thing in fiction. It keeps that tension going.